Parc Monceau can be found in the 8th arrondissement of Paris. The park was created upon the orders of Phillippe d'Orleans, Duke of Chartres and designed by Louis Carrogis Carmontelle (a close friend of George IV of England). The park covers 8 hectares and has an English style, informal layout. In the park there is an 'Egyptian pyramid', Corinthian pillars (see photo) and a Dutch windmill. There are also many statues and there is a rotunda at its main entrance. During the Second Empire the size of the park was greatly reduced (to its current size) but in 1860 what remained was bought by the Paris council and re-designed by Baron Haussman. Haussman put in two large avenues which cross in the centre. He kept the various 'follies' listed above and planted plants from around the world. This park is one of the prettiest in Paris, with lots of paths, ponds and stream. It is a popular jogging course and lots of wedding photos are taken here. The surrounding area is full of very pricey hotels. 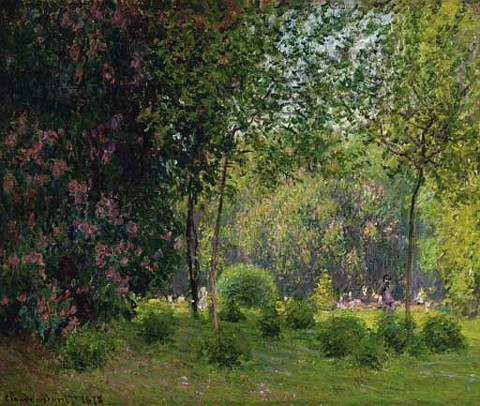 Claude Monet painted five paintings in the Parc Monceau. The above painting was painted by Monet in 1871. Park Monceau can be found in the 8th arrondissement of Paris at the junction of Rue de Prony, Rue Georges Berger and Boulevard de Courcelles. Access is from the Boulevard de Courcelles, Avenue Velasquez, Avenue Van Dyck and Avenue Ruysd. The garden is open all year round from sunrise to sunset with longer hours in the summer. There is a childrens area in the park and also it is a free Wifi area. Address: Parc Monceau, 75008 Paris. The metro station 'Monceau' is found at its main entrance - though in all there are 9 seperate entrances. These are staffed by a watchman whose family have held the same role for 5 generations!